Ecstatic Fridays at the Cyprus Shed Point Lookout. 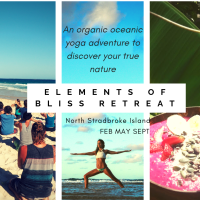 Breathwork, ecstatic dance, fire ceremony and elixers. SMS 0488113365 to book. Fun Fluid Vinyasa by the ocean. Gentle yet energising class for all ages and abilities. Mooloomba Headland Park, Point Lookout. Each class unfolds in a way that is synchronistic with the rhythms of nature. We move through earth, water, fire, air, ether to arrive at a place of oneness with the universal flow of prana. The yoga sequences (flows) work with the nadis (energy meridians) and chakras (energy centres) to create a state of balance and bliss from head to toes. We focus on releasing tension in the back, neck, shoulders and spine, opening the hips, hamstrings and the heart and supporting the bodies immune, digestive and nervous systems. Kath, Y.T. 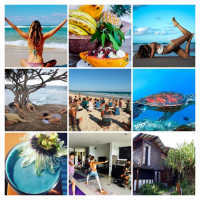 specialises in yoga for surfers, prenatal yoga, kids yoga, mums and bubs yoga, yoga for a healthy reproductive system and yoga therapy for back and neck pain and healing through yoga dance (Samahasana).